When planning a trip to the beautiful country of Ireland, travel tips always come in useful because which airport to use is not always evident, with budget not always dictating the answer to the question of whether to use Dublin or Shannon. We list the pros and cons of each of the Irish airports so that you can make an informed decision depending on what your holiday requirements are and what parts of the country you wish to see. Whilst money is always a consideration, saving $100 on flights may not always be the right move, as costs can often be recouped elsewhere, such as on car rental or accommodation. And even if costs are not recouped, saving time rather than a little money is often worth it to maximize your experience. 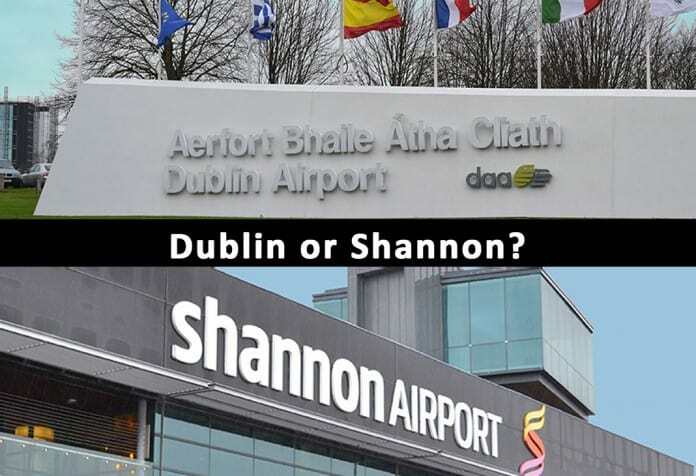 Which airport to choose out of the two Irish airports is a key consideration, with the following travel tips and advice about each of the airport destinations hopefully an informative read, particularly for those travelling from the US. Dublin is located on the east coast of the country. It is a great start and end point for trips discovering the city as well as the south east, north west and Northern Ireland. The main advantage of flying into Dublin is access to the capital city. You can easily spend a week in Dublin without running out of things to do. Another advantage of flying into Dublin is that you can quite easily manage without a hire car, as public transportation is so convenient. Taxis are readily available the minute you want one from the main terminal, and there is an Air Coach bus located just outside the arrivals hall. This travels between the airport and various locations across the city centre and back throughout the day. Using public transport also means that you can save money on the car rental for a few days. Then when you have seen all you want to see in the city, you can easily travel back to the airport – a quick half-hour bus ride is all it takes – to pick up your car when you are ready to explore. This gives you time to adjust to the time zone before getting behind the wheel, with a few days in Dublin a great potential start to your trip to and around Ireland. When you are ready to make your onward journey in the car, the M50, one of Ireland’s major motorways, is less than three minutes away, so you can be off to your next destination in no time. A downside to Dublin Airport is that it is among the top ten busiest airports in Europe and, as such, can get a little congested. It is also vast ,and its long halls may be a bit off-putting, particularly when you are tired and jet-lagged. On the other hand, Shannon Airport, where the concept of Duty Free Shopping started, is considerably smaller and far easier to navigate. Shannon is situated just outside Limerick on the west coast of Ireland and is ideally placed for trips around the west, south west or midlands. The most positive thing about Shannon airport is the speed at which you can navigate through it. Queues for customs, security and rental cars generally only take moments as opposed to hours, and you can be on the road again to your next destination in no time. While you may be jet-lagged and worried about getting behind the wheel so soon after arriving, traffic around the airport is usually quiet and getting lost is not really a concern. There are some beautiful sites close to Shannon, meaning that you do not have to drive for too long before you can stop again to absorb the scenery and atmosphere. The cliffs of Moher are popular, but Bunratty, Galway and Limerick are also close by and firm contenders. Another positive when leaving from Shannon Airport is that you only need to be there two hours before your scheduled flights as opposed to the three hours that is needed in international airports such as Dublin, allowing you to spend one more precious hour in the country and preventing too much hanging around in the airport. In addition to budget and whether you wish to drive straight after your flight, the main consideration has to be which parts of Ireland you wish to visit. Using a combination of airports is also an option, so you could fly into Dublin and out of Shannon or vice versa. A possible trip could be to fly into Dublin, spend a few days sightseeing there and then hire a car and visit the western part of the country and places such as Dingle, Kerry and as far down as Glengariff and west Cork, and then fly out of Shannon Airport. If your itinerary has you seeing a little bit of everything, then using both of the Irish airports can be a good idea. These travel tips do really depend on what areas of Ireland you wish to see, but hopefully they have gone some way towards helping you make a decision about which airport to choose. Now armed with these travel tips about which of the Irish airports to use, all that remains is to wish you a very happy holiday in the beautiful country of Ireland. Which airport you chose is now down to you.